Are you looking for the best hamster cage for sale for your Dwarf or Syrian hamster? 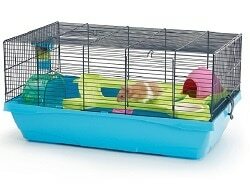 We have included a range of the most popular spacious hamster cages & large habitats in our price comparison table. Click Here for the Savic Hamster Heaven! 1.1.3 Security – Prevent Hamster Escape! 1.3.3 Savic Hamster Heaven – The Ultimate Cool Hamster Cage? 1.5.1 Stop Dwarfs from Fighting! 1.5.2 Two Wheels for Two Hamsters! 1.9.3 Better than Wood Shavings! 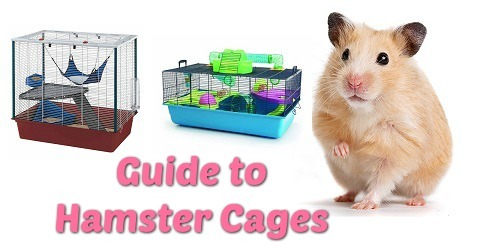 You will mostly find large cages here to meet the minimum size requirement of your pets; however, the smaller ones make great add-ons to any hamster habitat. If you are specifically looking for a cage for your dwarf hamster, be sure to check out the width of the bars because some species of dwarf are excellent at escaping through small gaps. All species of hamster are active animals and are known for traveling many miles a day in the wild so you should endeavor to give them the largest environment possible. Hamsters, like all small pet rodents, thrive and are happiest when they provided with plenty of space to move around. They are active creatures, especially at night time and will appreciate as much floor space as you can give them. Keeping hamsters in substandard cages can cause them to exhibit signs of stress such as bar chewing, decreased appetite and biting. Lots of smaller cages are available on the market today that offers excellent add-ons for the primary habitat but should not be used on its own. The biggest online hamster forums and communities recommend providing your pet hamster with at least 360 square inches of floor area for maximum comfort. Syrian Hamsters need an exercise wheel of at least 8 to 10 inches to prevent them from arching their spines while using it. Dwarf Hamsters living together require at least as many wheels as there are hamsters to keep them from fighting over them. Flying Saucers are also a fun exercise accessory for your hammy, but we recommend providing them alongside a standard wheel. Bigger cages are more entertaining for owners because you can furnish it with more accessories and toys such as wheels and saucers. Bigger cages increase the interval between fully cleaning out the substrate of the cage. This allows you to spot clean the toilet area regularly. The best cage for your pet hamster is the biggest you can reasonably afford. 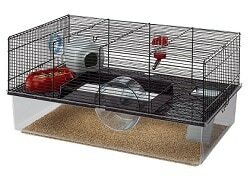 The RSPCA recommend that the minimum size of cage for a Syrian hamster should be 75cm x 40 cm x 40 cm. (29 ½ inches x 15 ¾ inches x 15 ¾ inches). Dwarf hamsters, being social animals especially need a lot of space to discourage territorial aggression. Check out Advantages of Large Hamster Cages for more information. What type of hamster will you have? It is crucial that you make sure your pet hamster gets as much fresh air as possible flowing through their cage, as it helps to keep them comfortable and healthy. Urine produces ammonia which can be harmful to a hamster’s respiratory systems in large amounts. Luckily, hamsters naturally produce little urine, so this very rarely poses a problem as long as their cages are cleaned out on a regular basis. Housing your hammy in a glass aquarium is great if you value a good unobstructed view of your pet. 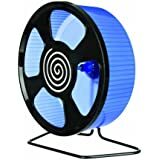 Airflow is even more important when housing your pet in a tank because there’s only one place it can come from (the roof). Tank Toppers are available on the market, or you can construct a DIY one. For optimum health and happiness, hamsters need their habitat to be cleaned out on a regular basis to ensure their environment is clean and free of germs that can cause them harm. Hamsters are clean animals that will choose to urine in a dedicated toilet area – Usually, this area is in the furthest corner from their nest area. Larger cages are beneficial from a cleaning standpoint because they are easier to spot clean. Larger cages also, do not need to be cleaned out as often as smaller cages. Crittertrail habitats and the like can take longer to clean out because of their small individual components & tubes. The traditional wire bar cage is the easiest type of cage to clean because they just consist of a wire frame and a plastic tray that’s soiled contents is easily tipped away after detaching the bars utilizing some attachment clips. Security – Prevent Hamster Escape! A key focus for any prospective cage buyer is security! You do not want to wake up in the morning only to find your much-loved pet has escaped! It is of vital importance to take note of bar width because Hamsters are escape artists and can squeeze through the narrowest of gaps. For Syrian hamsters, the space between each metal bar should be no more than half an inch wide. For dwarf hamsters, the bar width should be no more than a quarter of an inch. Choosing a secure cage for your pet will undoubtedly make your life a hell of a lot easier. You do not want to be googling “how to catch a loose hamster” after discovering your furry friend is under the floorboards. It is important to pay attention to any jagged edges or bad points that may harm your pet when they nibble on parts of their habitat. Hamsters love to chew and gnaw on cage bars especially if you house them in a habitat that is too small and lacking a hamster wheel and other toys. Even if you give your hamster inadequate space, there is a chance they will endeavor to escape by chewing on bars and the plastic areas of the cage. With enough time they will wear down areas that will enable them to escape. It is for these reasons that it is crucial to provide them with an adequate environment with enough room and plenty of toys. Hamster’s teeth continuously grow and should be encouraged to chew safe toys. There are some excellent toys on the market today that allow you to house a treat around a chewable toy giving your hamster something to focus their mind. Monkey nuts are an excellent treat for your hamster provides them with something safe to chew on making them an awesome boredom breaker. It is uncomfortable for hamsters to walk on wire floors as opposed to solid floors. Wire floors can also risk injury because their feet and limbs can continuously fall between the gaps. 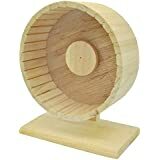 The same problem arises with rung hamster wheels. Solid plastic or glass are the best floors you can provide your hamster. Tall cages can provide a danger to hamsters as they love to climb but often struggle to get down, therefore, they drop to the ground. Most of the time dropping to the floor does not harm them, but there are exceptions if they fall awkwardly on a limb. You can drastically reduce the risk of injury by choosing a cage with more horizontal space than height. Hamsters should have a few inches of substrate on the floor to help cushion any falls. 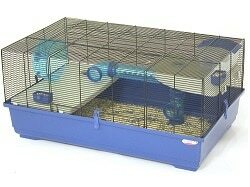 The most common type of hamster cage is the traditional bar or wire top cage with removable plastic trays. The main advantage of bar cages is that they have the best ventilation possible for your hamsters and they are easy to clean. 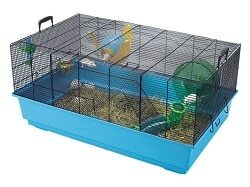 Wire cages have a shallow plastic tray which means bedding and substrate might get kicked out of the cage by the hamster making much mess on your floor. Some hamsters (especially Syrians) are prone to chewing on the bars which can make a lot of noise – Something to consider if your hamster lives in a bedroom. Bar chewing is usually less of a problem if you house your hamster in a good sized environment with lots of toys. Some bar cages have unpainted metal bars which mean they are prone to rust when coming in contact with a hamster’s saliva. Cages can range in price and quality dramatically. 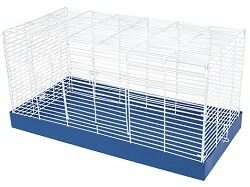 From the cheap no-brand cages to the premium quality ones like the ‘hamster heaven’ from Savic. Another option for your hamster habitat is an aquarium or a glass fish tank with an added tank-topper. The main advantage of housing your hamster in a tank is that they give maximum visibility for you, the owner to see your hamster playing and going about their daily lives. Glass aquariums can be heavy making them difficult to move around and clean. There are great alternatives to heavy aquariums on the market. You can purchase small pet enclosures such as the Zoo Zone or the Ferplast Maxi Duna which are clear plastic tanks which have all the advantages of a glass aquarium, but with the weight of a standard cage. Another significant advantage of this type of cage is that you can use an extra amount of bedding or substrate allowing your hamster to burrow down and create underground tunnels and nests! Ventilation is not great like metal bar cages, so it could be a factor to consider if you are not using the best quality substrate due to ammonia build up from urine. 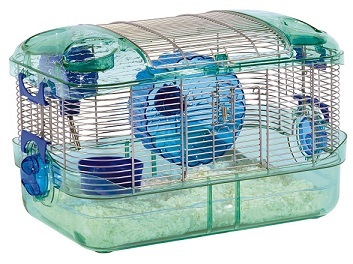 Hamster habitats from brands such as Crittertrail, Habitrail, and IMAC are becoming increasingly popular options for housing your pet hamsters. 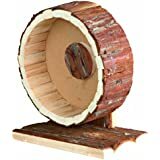 They come in a wide variety of styles with fully modular support – you can connect up different habitat areas with hamster tubes & accessories. There have been studies that prove that hamsters thrive best in wide open spaces, so it is not advisable to use these habitats as their only home. 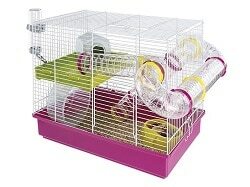 Modular hamster habitats make great add-ons for a larger open cage enabling you to have a fully unique home for your hamster. Dwarf Hamsters are communal animals but can sometimes become territorial and aggressive to each other. Modular habitats connected with tubes can encourage this territorial aggression. Add-ons & replacement parts for crittertrail and habitrails are readily available from most pet stores such as Petco, Petsmart and online, so it is relatively easy to upgrade. These types of habitat often come in a wide range of colors, such as pink, yellow or blue. Your hamster habitat should be the biggest investment you buy for your hamster. There are plenty of cheap sub-standard cages sold in pet stores that do not meet the minimum size requirement. If you are on a tight budget – ‘Ware Manufacturing‘ have some basic but big cages for sale that meet the minimum size requirement for both Syrian and Dwarfs that can be had for prices under 50 dollars on amazon. You can find some bargain hamster cages on eBay – Cages do not hold their value well on the second-hand market. Another great option are homemade bin cages – They can be made very cheaply and suit both Syrian and Dwarf Hamsters. If you are on a tight budget and cannot afford any of the cages featured here, there are other options. A homemade Bin Cage is an attractive option and with some DIY skills can reward you with the best cage suitable for your hammy. Bin cages consist of a big plastic storage container with some cut-out meshed windows for ventilation and a meshed top to allow air flow. There are many guides on the internet with full instructions. 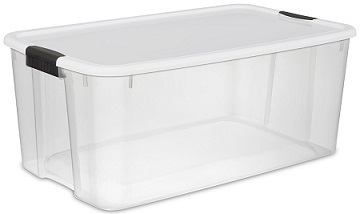 You will need; a large storage bin, some mesh, and bolts and washers that you can find for sale at office supply stores, Walmart or home depot type places. You will need to provide maximum ventilation at the top utilizing a tank topper or DIY mesh. Hamsters are creatures that can travel many miles in a single night in the wild; Therefore you can never give a hamster too much space. You can, however, give them too little, which is inhumane. 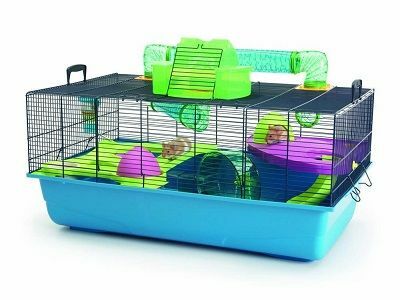 There are many large cages for sale on the market today that will give your hamster a great place to live as well as provide you much furnishing it. There are also many unsuitable habitats for sale which is unfortunate as space is the most important factor when providing your pet with a suitable home. Big hamster cages give you plenty of options for toys, wheels and other accessories making it fun for you, the owner as well. Syrian hamsters especially need large exercise wheels to prevent them from arching their backs while running. It can be difficult fitting a standard wheel in a standard size cage. Unlike Crittertrail type habitats, the large wire cage is very easy to clean. Consisting of a single plastic tray and wire covering, it makes it effortless to tip out all of the old bedding into a bin bag. There are very few tubes and plastic walls that need wiping down. Wire cages offer maximum ventilation for hamsters which is a massive health benefit as hamster urine gives off ammonia which can be harmful to your pet. Dwarf hamsters living together need a vast open space to facilitate their friendly relations. Dwarf hamsters can become territorial and aggressive to each other at a moment’s notice, so it is important to give them a suitable home. 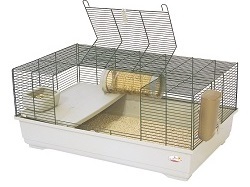 Crittertrail type cages that are modular and connected with tubes can encourage dwarf hamsters to become territorial and aggressive to each other. It is recommended to give Dwarfs roomy wide open space with no choke points where bullying could occur. It is also worth noting that tubes and tunnels could potentially make it easy for a hamster to get cornered and bullied. Spacious cages make your pet happier, healthier and provide you with peace of mind that your pet sees their home as a comfortable living environment rather than a prison. If housed in a large cage, hamsters are less likely to exhibit stress behaviors such as bar chewing on the bars. Some of the best extra large cages include the Marchioro Kevin, Marchioro Goran, and the popular Savic Hamster Heaven! 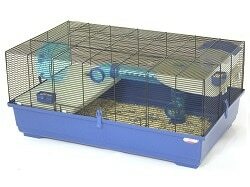 The Kevin 82 cage is a great hamster cage on the bigger end of the scale, and it features quite a unique layout making use of platforms to increase the walking area for your pet. The Two included food bowls are connectable to the bars by clips keeping them firmly in place – Great for hamsters that like to tip over their food bowl! The two upper levels are secured tightly by clips and give your hamster additional living room as well as a great view of their surroundings! The corner platform is an ideal space for the nest box which. 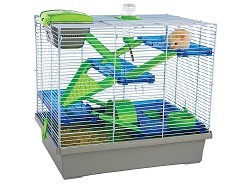 The wheel provided with the cage should be replaced as it is too small for Syrian hamsters; however, it is ideal for Dwarfs. Savic Hamster Heaven – The Ultimate Cool Hamster Cage? The hamster heaven is certainly not cheap, but this is one of the best cages for a lone Syrian hamster or a couple of dwarfs! You will rarely find it inside stores. It is a perfect size for a lone Syrian hamster and more than meets the minimum size requirements for the USA and Europe. The Hamster Heaven is very well made and designed with a high quality of plastics used for a worthwhile and lasting investment. 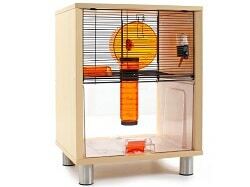 The dimensions are 50 x 80 x 50 inches giving your hamster a vast area to live and play. The cage is fully complete with tunnels, cool colored platforms, slides, houses, exercise wheel, toilet, food bowls and drinking bottle removing the need to buy these necessary extras! An awesome hamster cage with a huge amount of space if you have the budget. Sometimes known as the Teddy Bear Hamster – The Syrian is the most common and largest hamster available in pet stores such as Petco or Petsmart. Fully weaned Syrians should be HOUSED ALONE as they are solitary animals and should be living desperately by around the age of 2 – 3 months. Most cages on the market today, are aimed at Teddy Bear Hamsters, and they are best suited to the traditional wire bar cages. Habitats with tunnels might prove difficult for your pet if they grow to be too big. The hamster heaven, Marchioro Kevin 82 & Marchioro Goran 82 are ideal cages for Syrian hamsters. The most important thing to bear in mind when cage shopping for dwarf hamsters is to pay attention to the width of the bars. Being smaller than Syrians – Dwarfs are capable of squeezing through the narrowest of gaps. Robo dwarf hamsters (Roborovski) are particularly small and are prone to escaping! If you plan on housing a pair of dwarfs or even a small group, we recommend you buy them a wide open space to facilitate good relations. Dwarfs can live all of their life peacefully; however, improper housing can cause fighting. 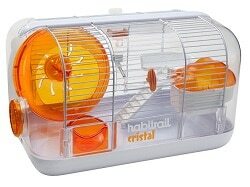 You should avoid habitrail type cages that are commonly for sale marketed towards dwarfs because the tube and modular nature of these cages tend to encourage hamsters to become territorial over certain parts of the habitat. Two Wheels for Two Hamsters! A pair of Dwarf hamsters should be provided with two hamster wheels to prevent squabbling, and sometimes multiple food bowls. A larger open space cage would be ideal to facilitate various accessories for them. Zoo Zone habitats are excellent for Dwarf hamsters however you would need to mesh the top as the bar width are far too broad for Dwarfs, or you could just prevent them from reaching that high. Occasions might arise where you will need to travel with your hamster when moving house or veterinarian visits. 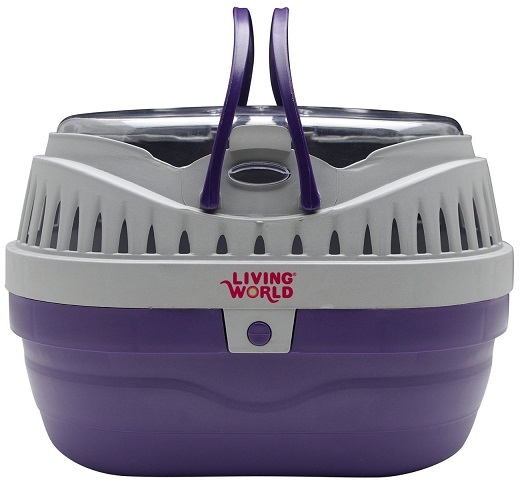 The Hagen Living World Pet Carrier comes in two sizes, and the smaller variant is an ideal hamster travel cage as well as suitable for other pets such as gerbils and mice. It is fully ventilated ensuring a comfortable ride for your small pet. 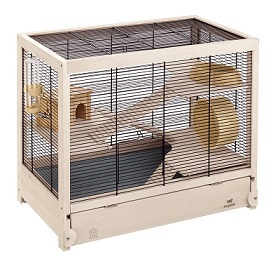 The Hamsterville is an excellent looking wire net structured cage built with sustainable wood. It has different levels to give your hammy maximum floor area and places to explore. Cleaning the shelves is made easy with a liquid resistant material coating. A key feature of this cage is the pullout tray making it simple to remove and clean up hamster waste and substrate. 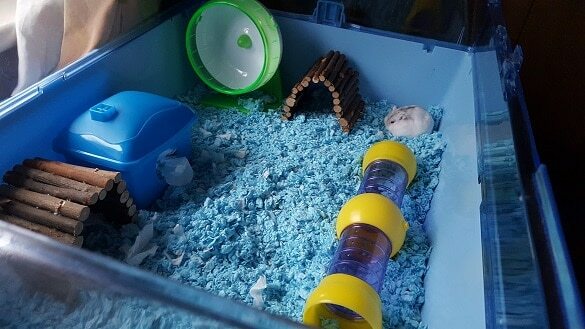 The Hamsterville comes complete with a hamster house, bottle, bowl and exercise wheel. If you want the biggest hamster habitat in the world, then look no further than the IKEA Detolf. The Detolf is a glass door furniture cabinet but as luck would have it, makes an excellent home for a hamster or other small rodents. German hamster enthusiasts initially discovered this fantastic hack, but it has now become popular across the world where IKEA stores are available. Below are some of our favourite toys, food, and accessories for your hamster friend. 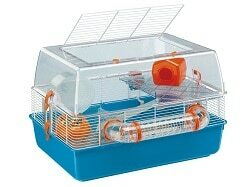 It is vital to furnish your hamsters cage with the right toys and accessories to maintain a healthy and happy pet. 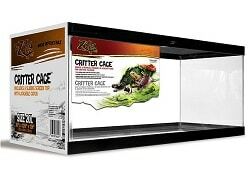 You have found a great cage – Now you want perfect bedding or substrate to put in it! 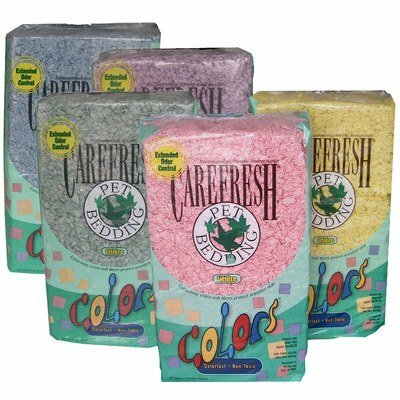 Colored Carefresh is HEALTHY, SAFE, and FUN for you and your pet and will make your cage look great! Carefresh is dyed using the same materials common in homes around the world for over 40 years. The colors are colorfast so cages, pets, and clothing will not be stained. The colors are non-toxic to pets. Carefresh is processed to remove potentially harmful hydrocarbons that exist in pine and cedar oils. It is also tested for contaminants and sanitized to 380ºF to destroy bacteria, fungus, and mold. Carefresh has been proven to suppress ammonia formation for up to twice as long as wood shavings. Your home and your hamster’s cage stay fresher smelling for longer. 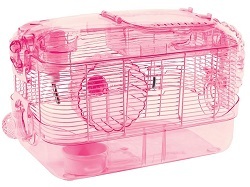 You can use Carefresh to create a theme in the cage and liven up your hamster’s habitat! A colorful habitat will also make your room look beautiful. You can use Carefresh as the primary substrate for your cage, or just use it as bedding material. If you want a fancy cage, get Carefresh! Online communities have regarded Supreme Hazel Hamster Food as being one of the best commercially available hamster food for sale in the United States. The nutritional requirements for hamsters are: Protein: 17% – 22%, Fat: 4% – 7% and Fiber: 8% – 15%. 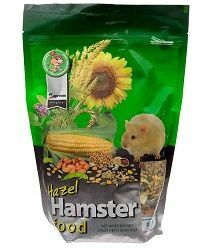 Hazel Hamster Food satisfies these requirements perfectly while containing a good variety of ingredients. Most other commercially available hamster foods are full of molasses and added sugars, which are very unhealthy for hamsters. Dwarf Hamsters are prone to diabetes, so this food would not be ideal unless you pick out the high glycemic content such as corn and sweet corn. A better solution for Dwarf hamsters would be Vitrakraft Vita Prima Dwarf Hamster Food. 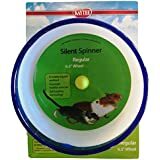 Kaytee Silent Spinner is essential if you value your peace and quiet! 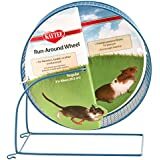 Most standard hamster wheels that come included with some hamster cages are simple plastic axle mechanisms that rub with friction. Cheaper wheels can become very noisy needing constant lubrication. Kaytee Silent Spinner wheels have patented bearing technology that makes them whisper quiet with no need for lubrication. They are available in two different sizes, 11.5cm and 16.5cm. Ideal sizes for Syrian ‘Teddy Bear’ Hamsters and Dwarf Hamsters respectively. You might have the best hamster habitat imaginable, but your hamster will surely enjoy some adventure time out of it. 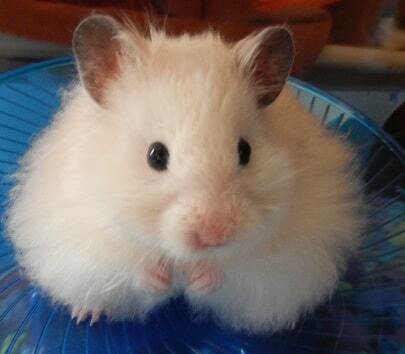 Kaytee 7-inch Hamster ball is a well-made ball perfectly sized for Syrian hamsters. 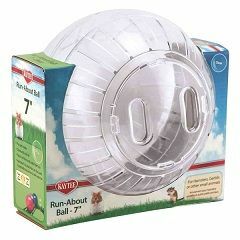 The hamster ball provides the perfect apparatus to let your hamster let off excess energy in a safe and controlled manner! Under supervision, run around hamster balls also provides a perfect temporary area to stay while you clean their cage out. There is also a 5 inch Kaytee Hamster ball that is suitability sized for Dwarf Hamsters. 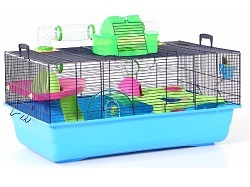 For added safety – you can use your hamster ball on a Hamtrac Raceway made by Superpet. The Hamtrac Raceway will provide your pet with a controlled exercise environment to run around. Hammy teeth are constantly growing, and as such, they need things to chew on to keep them down to a normal length. Giving your pet a wooden chew is safer them and discourages the noisy practice of chewing on cage bars. Pet hamsters that are excessively gnawing on their bars, you should have their habitat reevaluated. Super Pet’s Perfect Chews is an ideal solution for your cage. It is made from a variety of materials to clean and keep hamster teeth trim. The Loofah provides flossing action. It easily attaches to the hamster cage to and provides your pet with hours of entertainment and chewing pleasure. 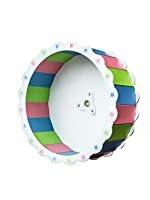 A Hamster Flying Saucer is an excellent addition or even a replacement for a traditional hamster wheel! 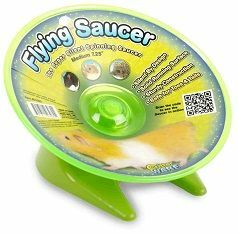 It has the added advantage of allowing 2 or more Dwarf Hamsters to run on the saucer at the same time and provide much entertainment for hamster owners. The Hamster Flying Saucer comes in 3 different sizes. Small for Dwarf Hamsters, Medium for Syrian Hamsters and Large for larger pet rodents. The only negative is that Saucers can take up a lot of ground space of your cage making a case for having a bigger cage even greater. Some of the best hamster cages for sale would not be complete without a saucer! 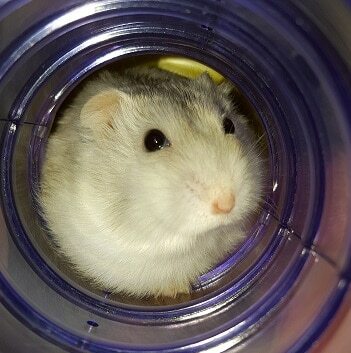 Syrian and Dwarf hamsters love tunnels and tubes, and we recommend them for several reasons. Tubes and tunnels provide hamsters with a great source of exercise and amusement. Hamsters will make good use of them for extended periods of time. Hamsters will make use of their saucer or wheels especially during the night when they are most active. Hamsters in the wild are known for traveling for many miles in a single night as well as burrowing down deep and building nests underground. Tubes and tunnels allow you to replicate their natural environment to some degree. 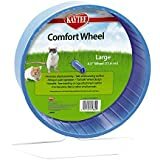 Tubes can also increase the amount of floor area available to your hamster effectively giving them more room to roam around. With hamster tubes, you have the option to rearrange them in a different order every so often giving your hamster a “brand new” environment to explore. Doing this prevents your pet from becoming bored of their surroundings and keeps them thinking. Many cages for sale already come with tubes, especially the crittertrail type habitats that are inter-connectable with each other. If you have a wire bar hamster cage, your hammy might appreciate some extra tubes scattered around their floor. Tubes give hamsters something fun to explore. It is important to be aware that different brands of hamster tubes are not compatible with each other. Whatever brand of habitat your hamster lives in, you should stick to one brand of tube. Keeping to the same brand ensure maximum interconnect-ability. If you attempted to connect cage-tubes that are not of the same brand you risk a weak connection. Giving your hamster a weak point to exploit and possibly escaping. You should clean the Tubes and the main cage regularly. Urine and food waste can accumulate in the tubes, and this can cause a nasty mess for your hamster. Hot water and a pet-safe soap should be used to clean everything relating to your hamster’s habitat. A scrubber with a long handle is an excellent tool for tube cleaning. Tubes should be rinsed thoroughly with fresh water and dried well. It is important the tubes are thoroughly dried as residue can cause bacteria and mold growth. Depending on what size hamster you own, you should make choose the tube accordingly. Naturally, the most popular hamster habitats and tubes are marketed towards the more popular Syrian hamsters. Place the tubes horizontally so the Dwarf hamsters can make use of Syrian size tubes. Vertical tubes that are too broad are impossible for dwarfs to climb. Providing your Syrian hamster with dwarf size tubes presents a danger that your pet may become stuck. There are plenty of options for DIY tunnels for hamsters – PVC Pipe, Toilet paper or paper towel rolls just to name a few. 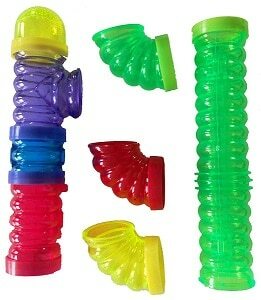 Kaytee Fun-nels Tubes are a cost effective set of tubes for hamsters. They are primarily designed to connect Crittertrails together, but they work just as well as standalone tunnels placed on the floor of a conventional cage.